Aloe vera has been widely used for centuries in traditional and herbal medicine for its innumerable skin soothing benefits. The plant is a skin power-food and finds a special place in a plenty of personal care products because of its qualities. And why not? After all, this magic ingredient is used in abundance for its multiple benefits. * Aloe vera is one of those few wonder plants that are widely praised for their amazing healing virtues. The ingredient is also known for its anti-microbial, anti-bacterial and anti-fungal properties. Because of this, aloe vera is a great choice for personal care products that people opt for day-to-day basis. * Aloe vera is known to help hydrate skin and give it a natural glow. The aloe vera plant has the ability to store considerable amounts of water. Due to this, the plant has the ability to hydrate and moisturise the skin, making it perfect for people with dry and flaky skin and also helps in increasing water content in skin. * Aloe vera has gel inside its leaves which has been used for centuries to treat wounds, scars and other skin problems. Moreover, the plant also helps in fast healing and recovery. The soothing and moisturising properties of the plant offer relief for various skin conditions. It has anti-oxidant and anti-bacterial properties hence when you apply on the skin it inhibits the growth of certain bacteria that can cause infections in humans. * Given its anti-microbial properties, aloe vera is ideal when it comes to getting rid of blemishes, blackheads, whiteheads, scars and acne. This magic ingredient is a rich source of vitamin C, and provides skin and wound healing and anti-inflammatory properties that reduce skin inflammation. It also helps in the production of collagen, which ensures that the skin remains smooth and supple. Moreover, aloe vera is also an excellent source for reducing skin tanning and sunburns. * Aloe vera is known to maintain skin elasticity and supports anti-ageing. Additionally, the ingredient is also rich in vital vitamins such as vitamin E and vitamin C. A lot of beauty and personal care brands often include aloe vera in their anti-ageing formulations of their skincare products because of this property. 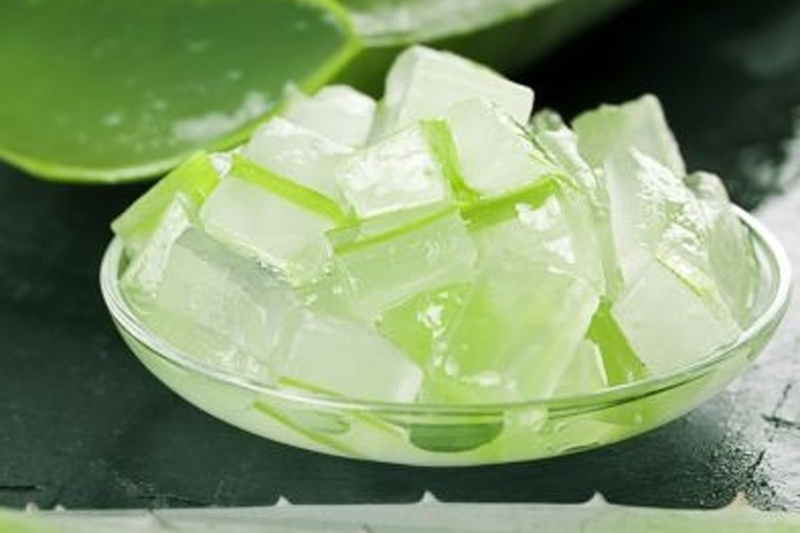 The gel found in aloe vera leaves is known to hydrate and create a soothing sensation on the skin, and also helps combat ageing while preventing fine lines and wrinkles. * Aloe gel-like flesh inside the leaves contains more amino acid and moisture than its leaves and any other parts of aloe, which helps soothen the skin damaged from UV rays and heat while providing intensive moisture to the skin.